The winter and holiday season can leave you feeling a little drained; full of sparkles and glitter, rich colours and fabrics, the intensity of dressing around this time can make us want to take a step back and pare down our wardrobe choices in the new year. This is the very point of the Spring/Summer season – it comes just at the right time when we want to opt for softer, more delicate styles. From colours, to fabrics, to textures and silhouettes, Spring/Summer collections are the antithesis to the loudness and boldness of the festive period. It’s time to take inspiration from the peace, tranquillity and beauty of nature, while also dipping into the realm of the arts to completely transform your wardrobe. 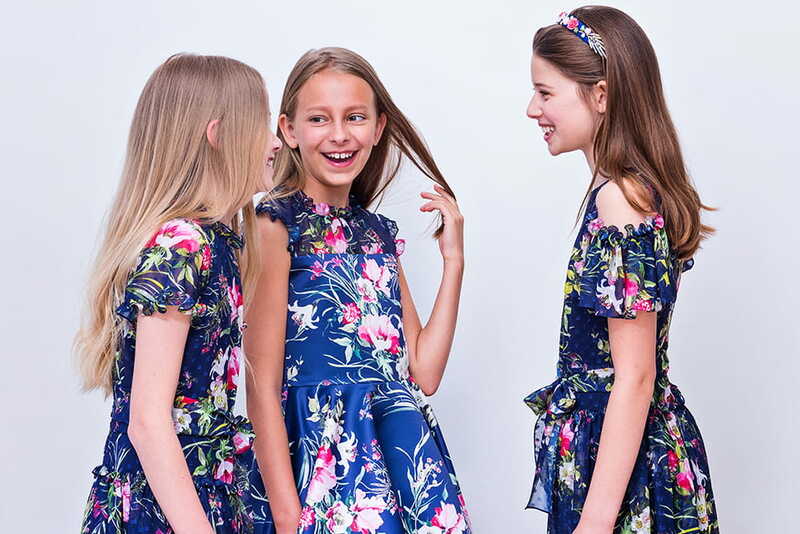 This season, David Charles’ new collection is focusing on the classic tropes and traits of Spring/Summer kids fashion clothes and trends, but that’s not to say it’s anything ordinary. 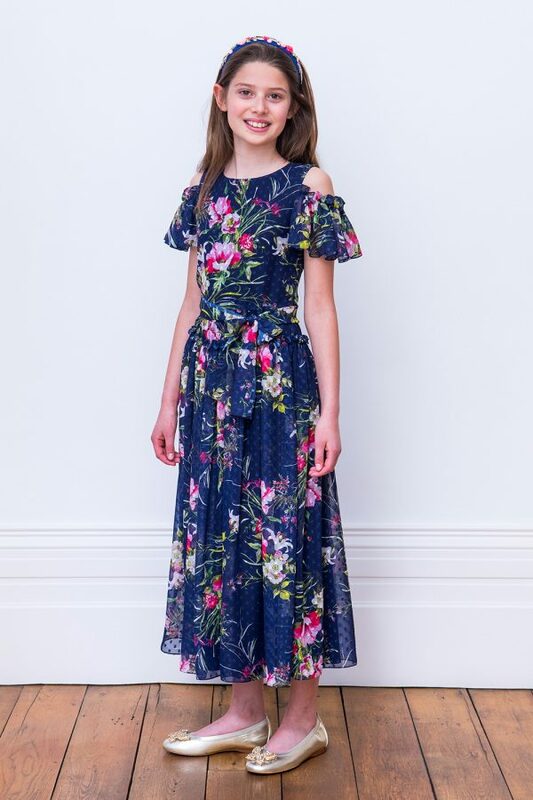 This collection sees David Charles take the stereotypical florals and feminine colours of spring and summer and turn them on their heads; inspired by the dreamy, hazy pastels of Monet paintings, warm summer days and the soft beauty of blooming gardens, these pieces represent a new take on the usual suspects of Spring/Summer kids fashion. The collection also provides something for every style. If you’re not into florals, opt instead for colour-blocked items which are bold yet still understated. Tulle and paler palettes create a more feminine look, while maxi dresses and straighter silhouettes cater for a more mature, sophisticated ensemble. There are also brand new accessories on offer, so even if you’re not ready to think about a new wardrobe of gowns, then these more subtle options could be the perfect way to make the transition from Autumn/Winter to Spring/Summer. To find out about our favourite pieces, in addition to some essential styling tips, take a look at our round-up of the top 5 picks from the collection below. Spring is a time that makes us think of regrowth and revival, hence why flowers and floral patterns and themes are such an integral part of Spring/Summer dressing. 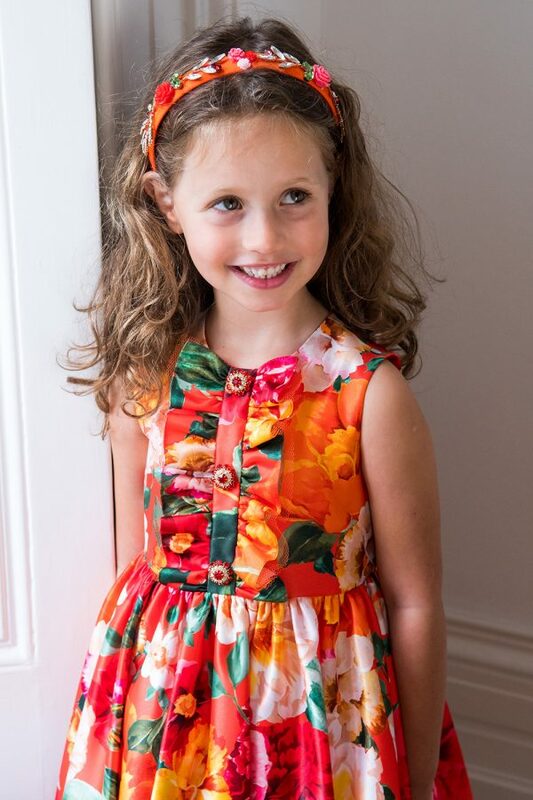 This bold and bright gown is full of sunshine brights in the way of oranges, reds and greens, and is perfect for anyone with an equally bold sense of style. Featuring an A-line silhouette, the simplicity of the shape is complimented by the richness of the print. Pair with simple footwear and a matching headband for the perfect head-to-toe outfit that is the ideal choice for any occasion from daytime garden parties to family events. Sure to brighten up any dull day! The complete antithesis to the Orange Floral Summer Dress, this ballerina-style gown combines all the elements of a party dress and the tutu of a prima ballerina’s dreams. Comprising of white, pale blue, and interlacings of gold, this gown’s careful design echoes the hazy, dream-like nature of Monet paintings, evoking images of tranquil spring settings and the calmness of nature. 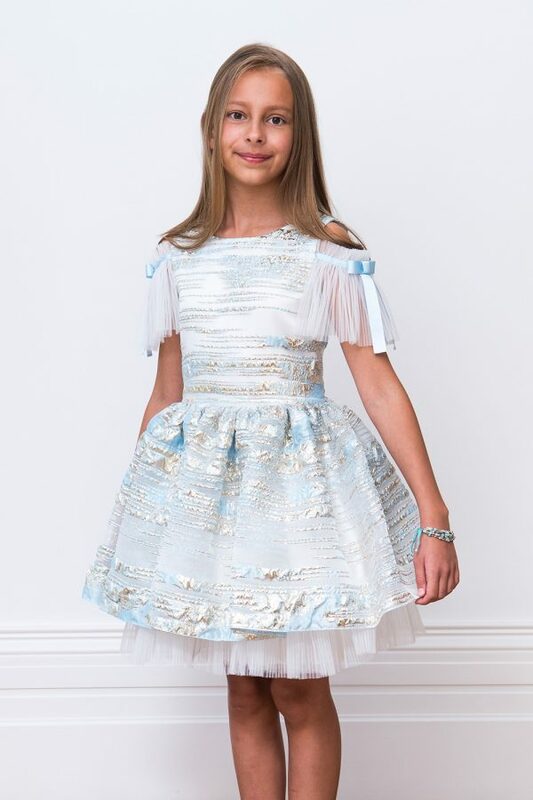 Inspired also by the theatre, this gown is perfect for any girl with a theatrical, dramatic side; the off-the-shoulder ruffles and ribbons add yet another dimension and touch of elegance. Combine this piece with silver or gold accessories to perfectly balance the subtlety of the gown’s gold embroidery. Wherever you choose to wear this, you’re sure to be the star of the show in this dazzling number. Continuing the theme of florals, this maxi dress inspired by botanical gardens is extra special as its long-line hem adds that extra touch of sophistication, maturity and elegance. Perfect for more formal events, it can also be worn to daytime garden parties with a simple flat ballerina pump. Containing a subtle polka dot chiffon fabric, the watercolour floral print is again an homage to the Impressionist painters who were so often inspired by the serenity and blissfulness of nature. This piece also features elasticated cold-shoulder sleeves and a tied-waist detail which also contribute to the elevated look it already creates. This ankle-length style has been particularly popular in the collections of many designers as of late, recalling the glamorous gowns of 30s Hollywood movie stars, ensuring elegance and timelessness. 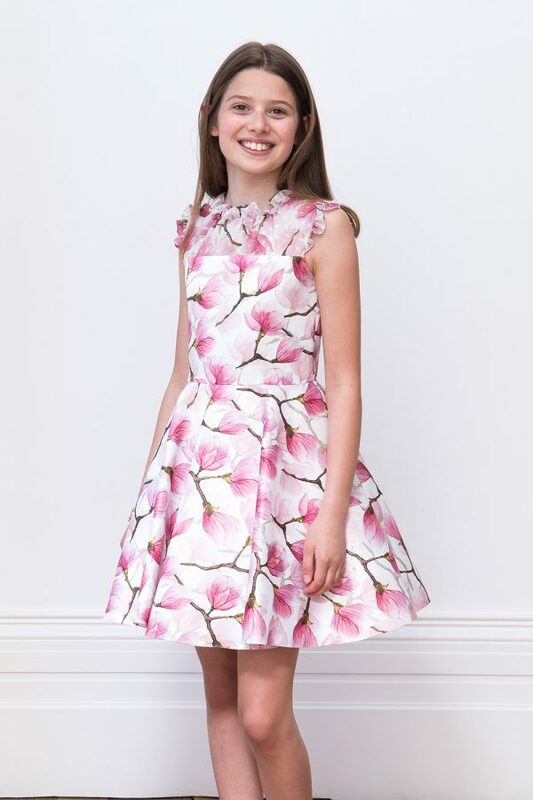 This ivory and pink peony-clad tea dress is the perfect example of how art can inspire kids fashion and bring it to life. The particular shade of pink is delicate while also remaining strong and full of energy, and the intricate detail of the flowers is sure to impress. The simple silhouette is complimented by a feminine ruffle neckline, adding an extra level of detail. To complete the look, wear with a neutral shoe option and simple accessories so that the focus is sure to remain on the impressive features of the gown itself. Perfect for weddings, formal events, or any kind of party, this unique design is one of a kind and is sure to turn heads. While dresses and gowns tend to be the obvious main features of an outfit, accessories can be just as important. 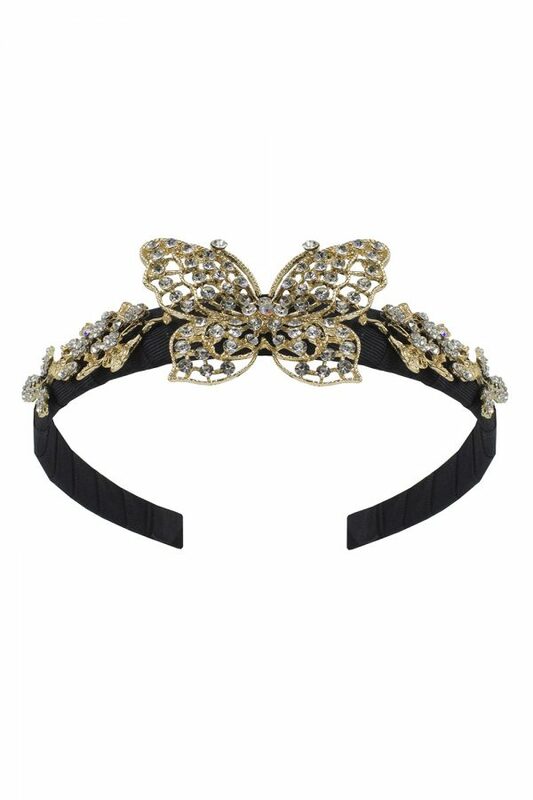 This season, complete your ensemble with a statement headband, such as this black Alice Band with gold butterfly detailing. It includes a beautiful black grosgrain ribbon in addition to glittering embellishments that bring the butterfly alive. Black is a staple in any wardrobe; it is classic and timeless, and will never let you down. However here, the detail of the gold butterfly instantly calls to mind images of spring and the beautiful, colourful butterflies that appear around this time. Despite being eye-catching, the simplicity of the black Alice Band means that it is never too much. Although some colours and styles are undeniably seasonal, this particular piece can be worn time and time again, whether combined with a standout ball gown or party dress, or even more casually to add extra oomph to an outfit. While these might be some of our favourite pieces, the collection is full of even more endless options to brighten up any wardrobe that may still be feeling the effects of winter. Though it might be cold outside currently, and perhaps still for a while, there’s no excuse not to plan ahead. For those of you who prefer to avoid patterns, there are plentiful pieces in simple colours and textures which instead draw attention with their unusual and intricate lines and silhouettes. Blue is also a noticeable feature within the collection; though not the most obvious Spring/Summer shade, rather usually associated with the frosty chill of winter, here it is used to reflect the (hopefully!) cool blue skies that are to come when the grey clouds pass. There are even designs which are featured in different styles; for example, the Ivory and Pink Peony gown can be found in a Drop Waist version, allowing you to choose according to your specific taste. So don’t hesitate when it comes to preparing for those exciting months ahead – it’ll be here before you know it.